Horseshoe buoys are manufactured with a firm core covered with a durable coated nylon. A grab line is fitted around the outside. Imported high density polyethylene – HDPE as outside shell, provide good feature of anti-oil, fire retardant, anti-shrink. lifesaving orange color, anti-fading under sunshine. 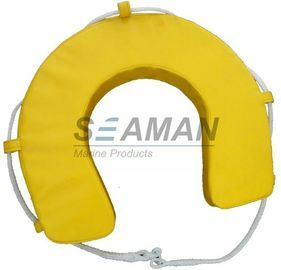 With SOLAS standard high visible reflective tape, confirm to the latest SOLAS requirement for marine lifesaving. 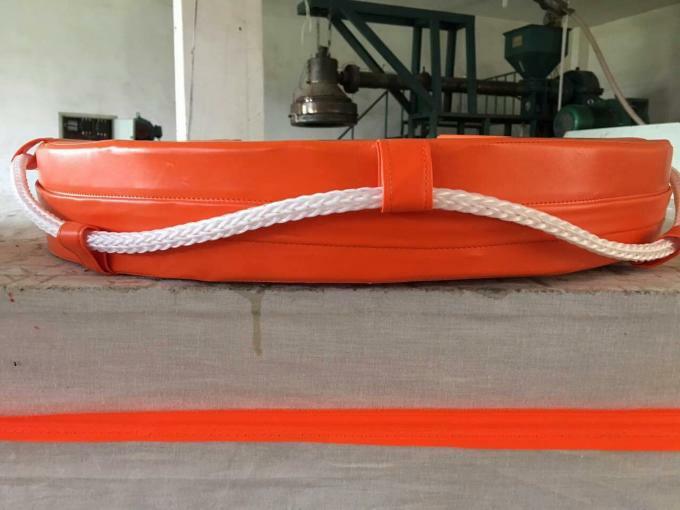 the outer edge of the lifebuoy fitted with grab ropes with diameter above 9.5mm. if somebody fall into water during voyage, he will shout to catch the notification of others. The finder should take the lifebuoy nearby and throw to the drowning man. The specific method: Throw to the windward of the drowning man. He should grab the rope first, press one side of the lifebuoy with his hands to make the lifebuoy at vertical position, dive into the lifebuoy by head and hands. Put the lifebuoy under the arm, keep the head above the water and waiting for rescue.